Detail of the printed mark found on the base on an early Mintons Secessionist example from the Alessandra and Simon Wilson collection. Mintons was a British ceramic company established in 1793. From c1901-1916 they produced a range of pottery called Secessionist Ware, designed by John W. Wadsworth under the art directorship of Léon Victor Solon. The stylised floral and foliage designs constitute a major British contribution to the international style of Art Nouveau. However, Solon and Wadsworth named the collection after the leading European Art Nouveau grouping of the time, the Vienna Secession, whose first international exhibition had been held in Vienna in 1898. The use of industrial manufacturing methods meant the Mintons Secessionist range was more accessible to the popular market than other smaller studio or hand-made pottery. This exhibition of chargers, toilet ware, vases, pedestals, flower holders, candlesticks, jardinières, a cheese stand, plates and other utilitarian wares, alongside archival material from the Minton Archive, demonstrates the innovative approach to colour that Léon Solon contributed to the Secessionist range, combined with John Wadsworth’s designs of often radical abstractions from plant forms. The exhibition also examines Wadsworth's advocacy for the decorative arts, highlighting both Solon and Wadsworth’s contribution to British design between 1900-1915. Throughout the exhibition ‘The Democratic Dish: Mintons Secessionist Ware’ visitors are invited to complete this template (physical or digital) inspired by the work on display. From the submissions, four will be selected to be turned into transfers and workshopped onto ceramic chargers. Submissions close on Friday 19 October, with the judges selection announced on Friday October 26, the final day of the exhibition. The workshop for the winning designers will be led by Amy Hughes, ceramic artist and specialist ceramics technician at Chelsea College of Arts, on Saturday 3 November. The ceramics will then be on display for six weeks in the Chelsea Cafe opposites Chelsea Space (19 Nov - 14 Jan). Judges include: Grayson Perry RA, Turner Prize Winner and UAL Chancellor; Donald Smith, Director of Chelsea Space; and Amy Hughes, as above. *Grayson Perry will announce the four winners on Friday 26 October, 7pm. Drinks reception 5-8pm. Collecting, Archiving, Making, and the Place of Ceramics in Art and Society Today. Léon Victor Solon was artistic director of Mintons between 1895-1905. Son of Marc Louis Solon, grand-son of Léon Arnoux (both employed by Mintons). Studied at Hanley School of Art, and then in 1894 at the Government School of Design at South Kensington (which became the Royal College of Art). After moving to the US, Solon developed a career as a designer of architectural ceramics, nick-named ‘Prince Polychromy’, his designs included the colour scheme for Rockefeller Centre’s sculptural decorations. Apprenticed as a silk designer, he attended classes at Macclesfield School of Art. in 1898 Wadsworth won a National Scholarship to the Royal College of Art where he studied under Walter Crane, Lethaby and Pike. Named Senior Scholar and awarded a travelling scholarship, Wadsworth spent several months in Paris in 1899. in 1901 he was appointed assistant art director at Mintons, and was appointed Art Director when Solon left Mintons in 1905. In 1915 he went to work for the Royal Worcester Porcelain Company as Art Director where he stayed until 1931. He was at Mintons again from 1935 until his death in 1955. 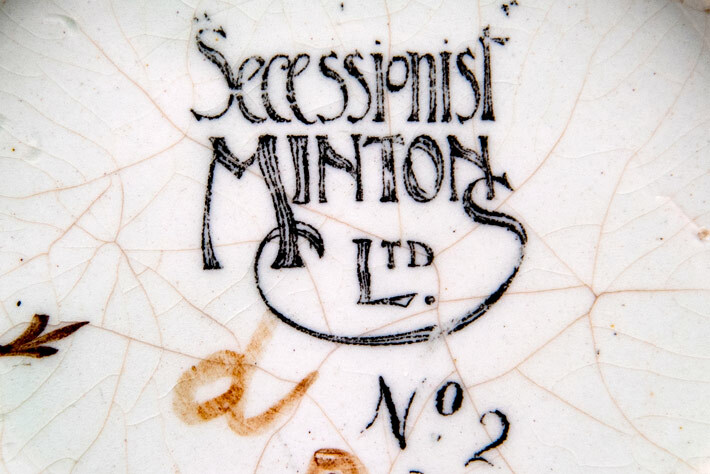 The Democratic Dish: Mintons Secessionist Ware would not have been possible without the generosity and encouragement of Simon Wilson, and the support of the staff at the Minton Archive, Stoke-on-Trent City Archives, and Donald Smith, Director Exhibitions at Chelsea Space. Special thanks to Chris Latimer, Andrew Dawson and Mrs M. Lewis. The curator of the exhibition would like to acknowledge Arts Council England for additional funding support for this exhibition.